As much as Fall portends the beginning of the cold and dreary, I think it is THE most gorgeous time of the year. It isn't too cold for one to step out, take a deep breath and smile and see people smiling back (come Winter and nobody smiles in NYC. They just hurry past!). And, the best part, of course is seeing Nature putting on a simply glorious show! 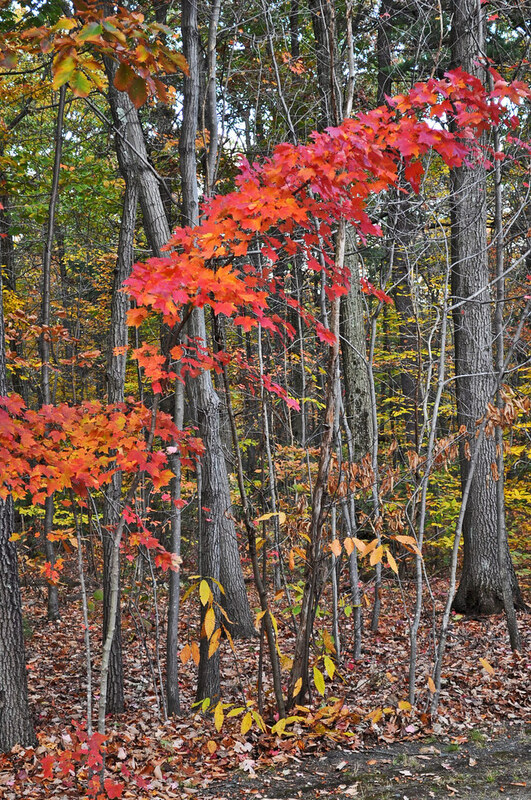 The red and golds of leaves simply warm your heart. However, it is only for a short period of time that one can enjoy this Nature's dance. And, it doesn't always happen. It's a timing thing. 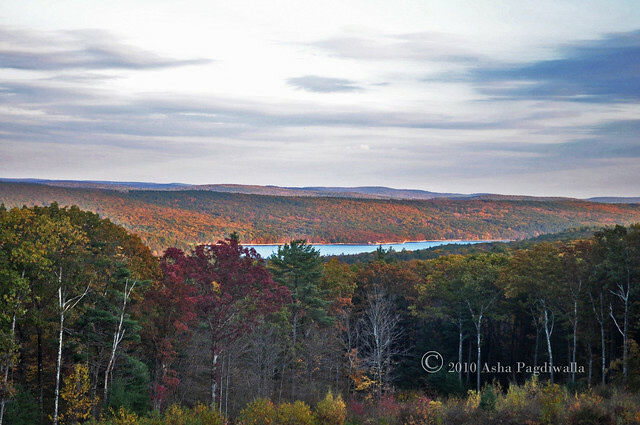 During my stay here in the North East, I have perhaps seen vibrant colors only once before this year. This year, this weekend (I am writing this post from Boston), we were lucky again! We decided to drive through New England and with much help from N.E. blogger El, we charted out a route that took us through some the most gorgeous regions we have seen during this season! Ofcourse any road trip like this isn't complete without food.I am not very big on road trips mostly because I fall asleep on the drive.. hehe.. actually I do that in any moving vehicle. It's the momentum I think. So, one way I stay awake is by munching. I always have a bag of something like crusty bread, fruits or other homemade snacks on hand in the glove compartment. 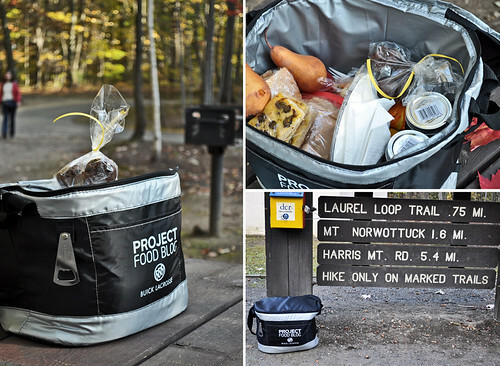 For the challenge we were told to "whip up a entree, side, drink, and dessert to enjoy after hitting the road, from picnics and school lunches to bento boxes, or any other meal on the go". When I saw the challenge, a. I went on a nostalgic trip and b. When I came back, I had way too many options for things to make and take. The story is this. Going to school in India, we would carry our lunches from home everyday. We all had steel lunch boxes that were carried along with a plastic water bottle in a plastic or wire lunch basket. Yes, they sell baskets especially for carrying lunches and there can be much status rivalry in that too! My lunch boxes typically had rotis with vegetables or some rice dish. I was a picky rice eater, so rice wasn't so common in my lunches unless it was either pulav or biriyani which were the only rice items I LOVED! My favorite lunches were typically Monday's because it was usually the leftovers of our Sunday lunch. Sunday was usually the day we ate meat, so it was an extra special treat for me to revisit the next day! Living in the US, and especially NYC, we have been fortunate to have the opportunities to explore almost every cuisine out there. Being natural foodies with little qualms for new experiences, we have had so much fun trying out new dishes and flavors. 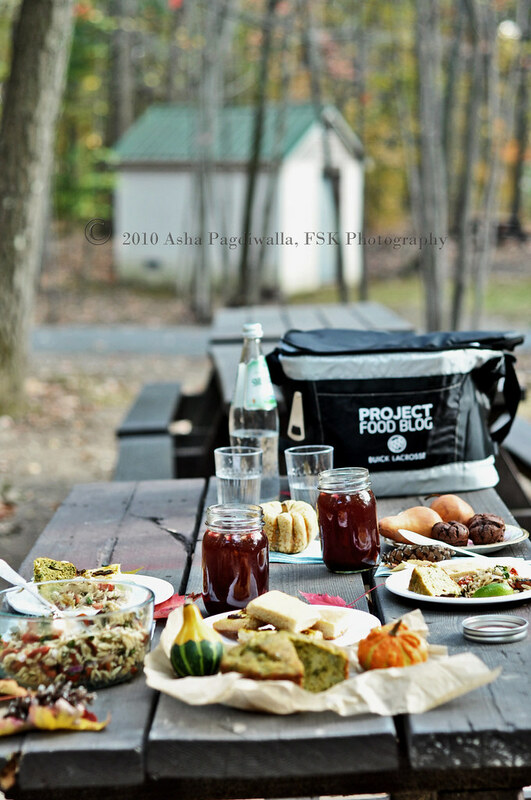 In my picnic basket for the trip, I tried to mesh all these experiences, his past, my past and our present, into a cohesive meal. 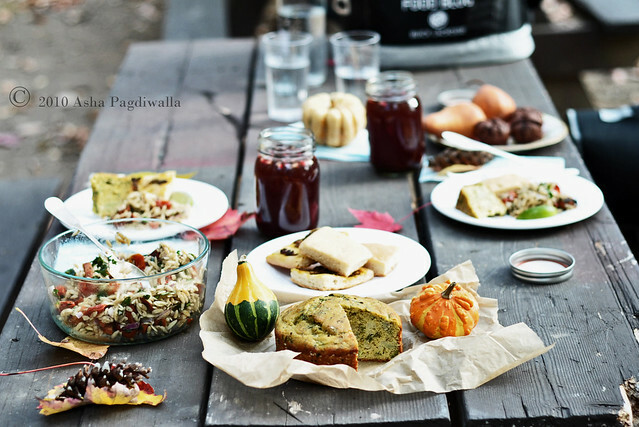 So, on our picnic table were, Warm Masala Orzo Salad with Cumin Roasted Sausages and Tomatoes, Spiced Cauliflower Cake, Ivy Gourd and Cumin Spelt Focaccia and for dessert Mini Brownie Cakes with Ripe Pears. 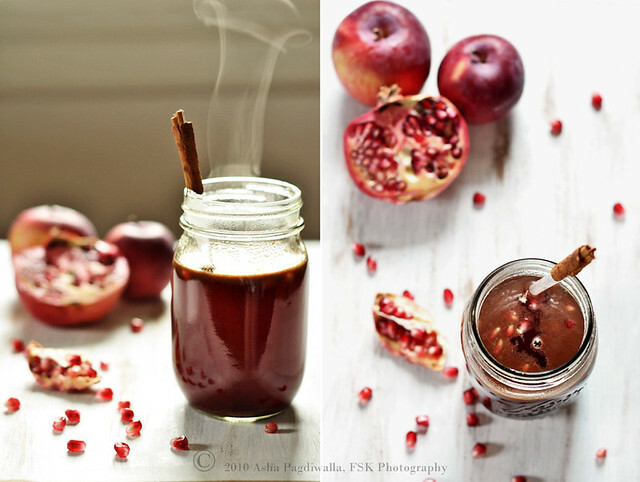 And to keep us warm, we were drinking Spiced Apple Pomegranate Cider. 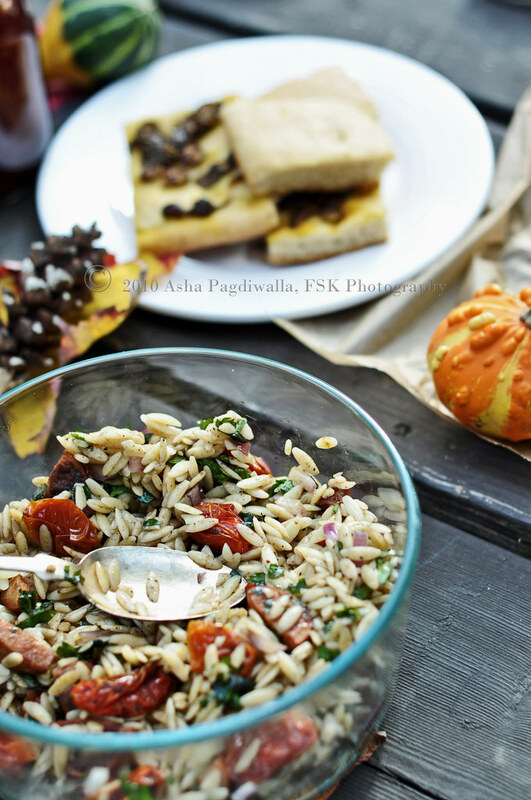 The orzo is new take on flavored rice that I love so much with the addition of sausages calling to FSK's childhood. They make sausage rice at his place :). 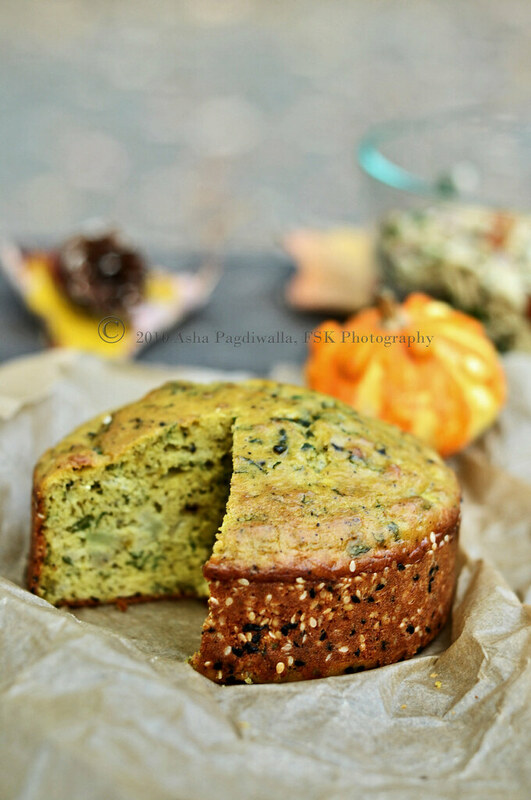 The spiced cauliflower cake was an inspiration from Deb, that was just perfect with the pasta. 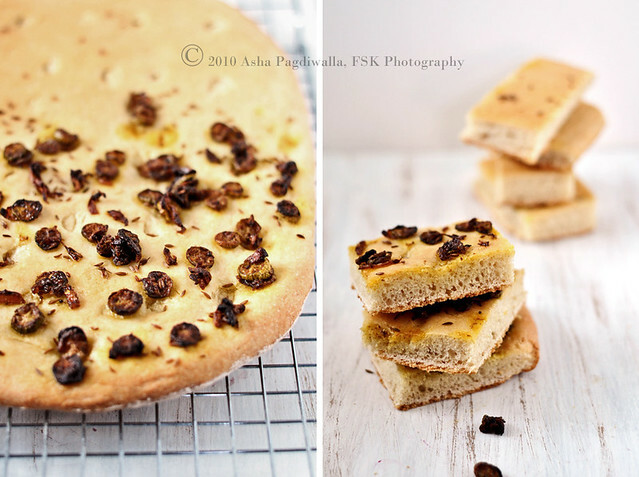 The, focaccia? Ivy Gourd is one my favorite vegetables and I use it here like one uses caramelised onions. Spelt flour is used to make rotis. Fruits are usually our dessert for hikes and trips, but for this trip, spurred by the challenge, I went for a little extra! 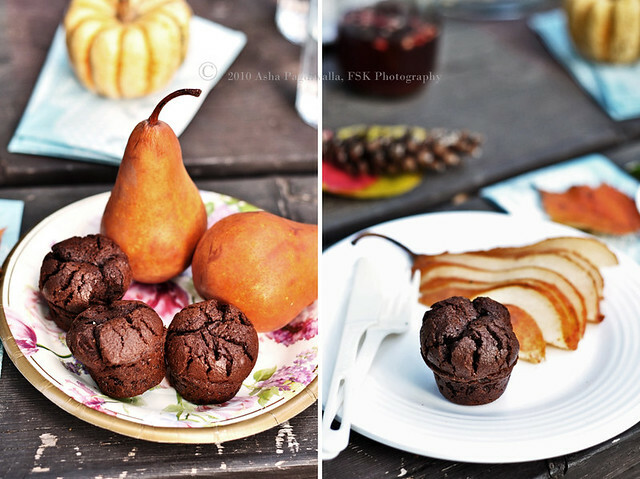 :) Chocolate pairs so beautifully with pears that it was a no brainer combination. 1. For any kind of trip, I usually prepare everything I need the previous night, so I am not frazzled the day of. This especially helps, when you plan early starts like for hikes. 2. For hikes, keep in mind that what you carry should, not only easily fit in your backpack, but, also last through hours in the sun. For carrying ease, wrapped foods like sandwiches work better than rice and pasta. 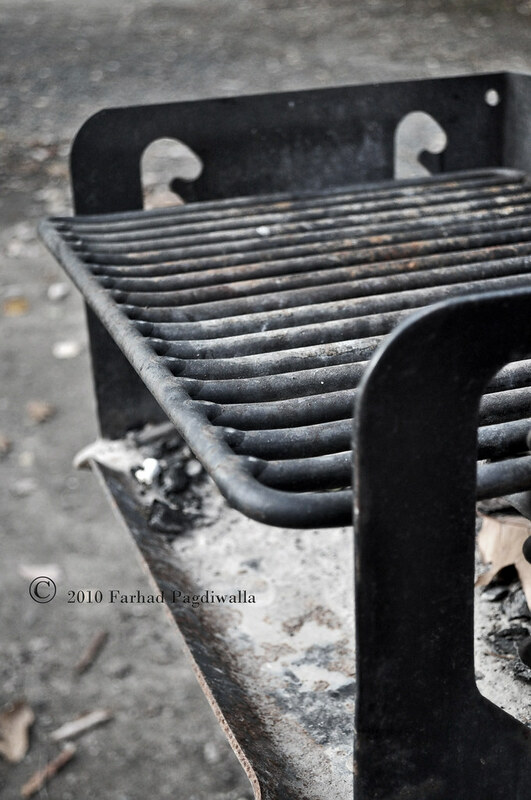 I avoid meats here since I am not always confident of how they handle heat. Always carry some fruit, non-squishy ones. They are the healthiest source of sugar for a boost of energy. 3. For road trips, a carb rich main such as rice, pasta or bread is good. I typically avoid raw items like raw tomatoes here since sitting for prolonged periods release juices that may detract from the dish. That's why I roasted the tomatoes in my orzo salad. 4. For healthy munchies, I like roasted nuts, ends of crusty bread or fruits. 5. We carried the drink in individual jam bottles. It not only looks cool but it's a great way to store any remaining drink and you know whose is which..
6. Invest in a set of reusable plastic/melamine crockery and cutlery. 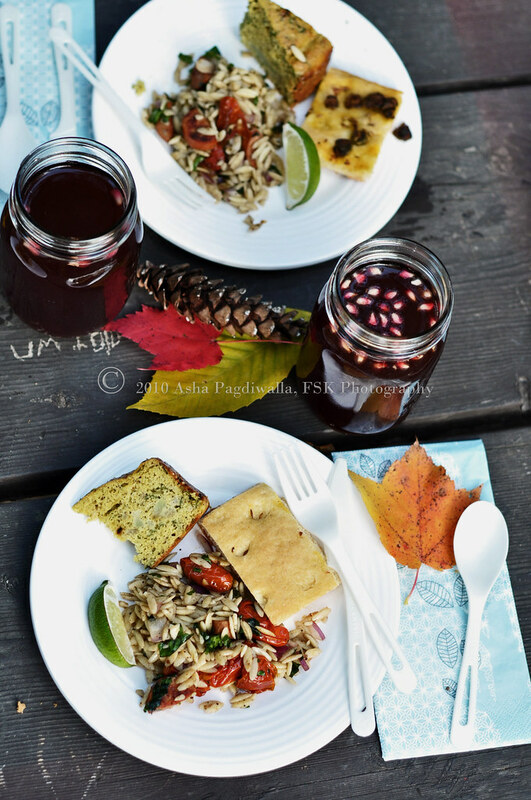 I used melamine plates, platic water glasses, plastic cutlery for this picnic. Another great way to carry items like bread is to wrap in parchment paper. Then at the picnic you can use the paper for plating as well! Toss the tomatoes in oil, salt, half the cumin and garam masala and roast at 300F for 1-1/2 hours until they burst and shrink. Meanwhile, saute the sausage with the remaining cumin until browned. Mix the orzo, onions, tomatoes, sausage and olive oil together gently. Taste and add more cumin and garam masala if needed. Before packing, warm the salad (not hot) in the microwave. Bring everything except the arils to a boil. Simmer for 10 minutes. Remove from heat, cover and let rest for half hour for flavors to develop. Pour into glasses, tops with some arils to serve.